A blog about adventures in Mordheim, Blood Bowl, and more! Doom Lords, Star Players Card Pack, and Chaos Themed Dice Unboxing! Well, I guess it’s been quiet a while since my last post. I didn’t really intend for that to happen, but I guess that’s the way it goes sometimes. Life can be interesting. With that being said, Games Workshop has finally given us some new Blood Bowl releases, and I’m back to give you all another unboxing. Now, you might notice right away that this post looks a lot different than my normal unboxing posts… Well, I decided that I wanted to try something a little different. I’ve been wanting to transition to video format for a while, and even toyed with a few video AND written posts last year. Well, this time I have decided to attempt a video only unboxing. I’m fairly new to the YouTube scene, so I hope you’ll bare with me. I hope that this will be the primary format of my unboxing moving forward, so let me know what you think in the comments below, or in the comments section on the YouTube page! For a while now, Games Workshop has been teasing us with images of the Elven Union team, and a new pitch to match. Andy Hoare even said several times that the team would be out by Christmas, so I was not surprised a few weeks ago when I heard that Blood Bowl pre-orders were about to be released. Once I saw the list, however, I was actually surprised by several things. 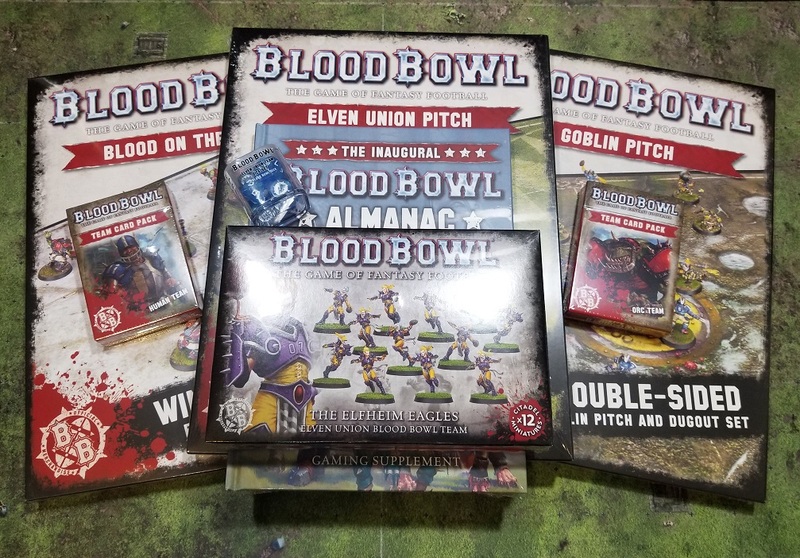 I didn’t expect the Human and Orc team card packs, the hard backed Blood Bowl Almanac, nor the new Goblin pitch. Honestly, I had even forgotten about the reports that the Blood on the Snow pitch would be available again this Holiday Season. Once I saw the full list, I simply sighed and started rounding up things to put on Craigslist and eBay so that I could pay for them… Being a completionist is never easy, or cheap. 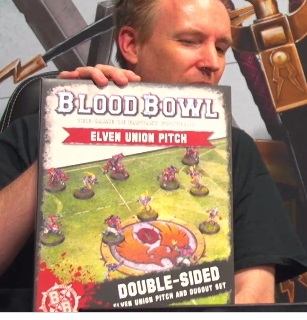 A post on Warhammer-Forum.com has shown off several images of new Elven Union related products for Blood Bowl. The low-res images show several new products including a new double-sided Elven Union pitch with on well manicured pitch on one side, and a frozen ice pitch on the other. Also shown is a single Elven Union die, an Elven Union team card pack, a package of card sleeves to fit the odd sized Special Play Cards complete with BB logo, a single random card with an image of what appears to be the Halfling Ref shown, and best of all, two images of the team sprues which look to show the Elf Union team as old school style multi-part plastic minis for maximum customization. Since it was re-released last November, by all reports Blood Bowl has been selling very well for Games Workshop. Since Blood Bowl 2016 was announced, many people have voiced concerns that Games Workshop re-releasing the game would put many third party mini companies out of business. It would seem that those fears were unfounded, because new crowdfunding campaigns seem to pop up on an almost weekly basis. With so many new campaigns starting all the time, I thought it would be a good idea to start a running series with a monthly collection of current Blood Bowl related crowdfunding campaigns. I won’t go into as much detail in these round up pieces as I do when I write about a specific campaign that I am excited about, but I will write enough to keep readers as up to date on current campaigns as I can. September brings us no fewer than five crowdfunding campaigns, so let’s take a look at what all is available this month! New Blood Bowl Dice are Here! And They are STILL IN STOCK! 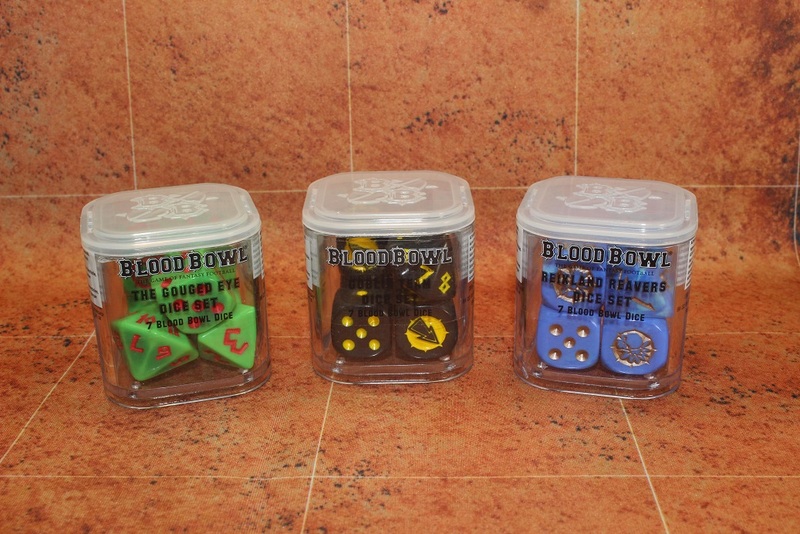 Recently a rumor surfaced that new sets of Blood Bowl dice were on the way, and other Blood Bowl items that had been long out of stock were making a return. Then last Saturday, pre-orders went up on the Games Workshop site for for new sets of dice for the Reikland Reavers, the Gouged Eye, the Skavenblight Scramblers, and the oddly generic, “Goblin Team.” Having been lucky enough to get one of the two sets allotted to my FLGS at launch, I skipped the Skavenblight Scramblers dice, but I did order one set of each of the new dice. Well, six days later, and one day before their official release, my new dice showed up in my mailbox. 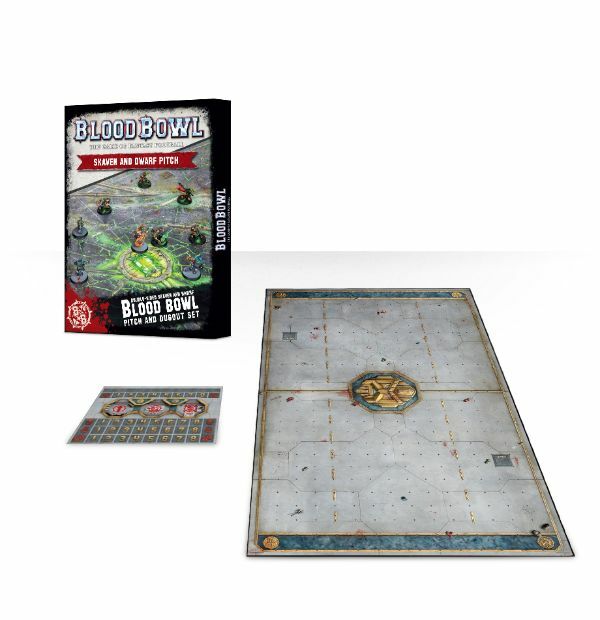 New Blood Bowl Items on Pre-Order This Weekend? For more than a little while now, reports have swirled that Games Workshop was working on replenishing stock of the Skaven and Dwarf pitch, as well as both the Skaven and Dwarf themed Blood Bowl dice sets. There was even an image of Reikland Reaver, Gouged Eye, and Goblin team dice that circulated the interwebs with reports that a release was imminent. Unfortunately, that release did not materialize then, but if Spikey Bits latest post about Games Workshop’s pre-release list for this weekend is accurate, then those dice sets and the Skaven and Dwarf pitch might finally be coming. They claim that the list is confirmed, and my experience so far has been that they are generally correct. More Blood Bowl dice are on the way according to Faeit 212, their source states stores are able to preorder new sets of dice and a new pitch. A Facebook user posted an image showing dice for goblins, Reikland Reavers and The Gouged Eye. Not sure why we need more dice for humans and goblins, but you know they’re going to sell like hot cakes. Do hot cakes really sell that well? I don’t know, ask IHOP, they seem to be doing OK.
Also, if they’re going to do another set of human dice, why not theme them for the Bright Crusaders? War of Sigmar also reports Death Zone Season 2, the goblin team and goblin booster pack are this week’s preorders. Wyrd Stones & Tackle Zones Facebook Page! Halflings hit Blood Bowl and Blitz Bowl!?! Wyrd Stones & Tackle Zones on Facebook! Wyrd Stones & Tackle Zones on YouTube!